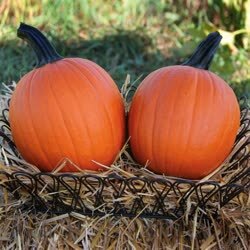 (F1) Mischief is the perfect size pumpkin for chain store, farmers' market and roadside sales. 2-4 lb. fruit set heavily on semi-vining plants and have a rich, dark orange color and dark, strongly attached handles. Mischief has a tall round shape and well defined ribs. Its fruit are uniform for both size and shape and its plant has intermediate resistance to powdery mildew.